uuid : a9cf1ff9-b423-4414-ab01-e9767a99a3e9 templates_id: 119501 templates_uuid: "84ee84f3-81d9-4c31-b5d6-7a114e73265d" title: "Reference letter" display_name: "Reference letter" meta_keywords: "Employer reference letter, reference letter, recommendation letter, reference letter template, letter of recommendation, writing a reference, job references and how to write a reference" description: "
You do not have to give a work reference letter, but if you do, it must be fair, accurate and appropriate. Use this recommendation letter when you seek to write a reference about a current or former employee. 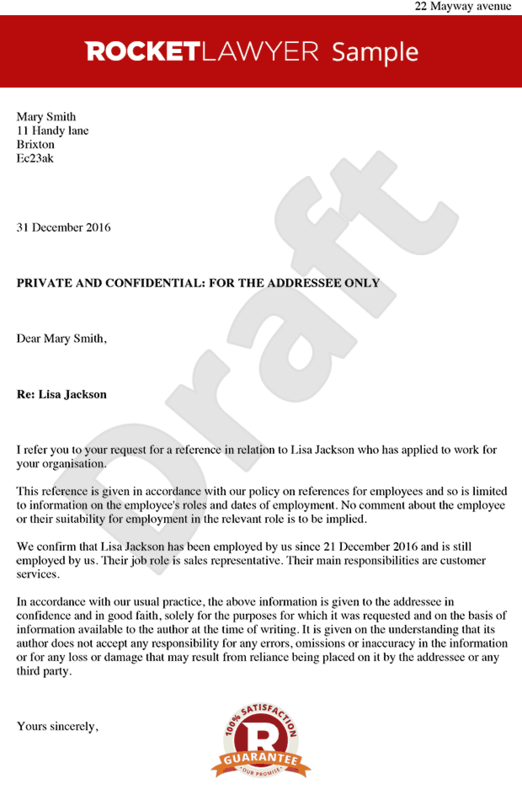 Ensure you don\'t fall foul of the law by using this letter to create a reference for an employee. This employment reference letter covers situations where a current employee has applied for a new position, or left your employ and been offered a new job.
" created_timestamp: "2018-10-08 04:36:27.0" modified_timestamp: "2018-10-08 04:36:27.0" active: true created_by: 236 modified_by: 236 dcm_id: 356 url_slug: "Reference-letter" meta_description: "Writing a reference is simple & quick using this reference letter template. Use this reference letter to create a recommendation letter for an employee. " time_to_complete: "10 minutes"
You do not have to give a work reference letter, but if you do, it must be fair, accurate and appropriate. Use this recommendation letter when you seek to write a reference about a current or former employee. Ensure you don't fall foul of the law by using this letter to create a reference for an employee. This employment reference letter covers situations where a current employee has applied for a new position, or left your employ and been offered a new job. More than just a Reference letter template, our step-by-step interview and guidance makes it easy to create your document. Easily create online, download, print and sign your free Reference letter in minutes. This document is also sometimes called: Employer reference letter, reference letter, recommendation letter, reference letter template, letter of recommendation, writing a reference, job references and how to write a reference.